Since our oven is (still) broken, I’ve taken to frying all of our food. Healthy alternative, right? Ha. If you’ll remember back to my lime cake doughnuts, I’m not a very experienced fryer. I need a better (read: stationary) thermometer, and right equipment to not burn myself and splatter oil everywhere, and in general could use a bit more experience. That isn’t stopping me! I had a lot of jalapeños on hand, and was craving something hot and carby — something I typically turn to my oven to provide. Our relationship is really taking a toll here, oven. 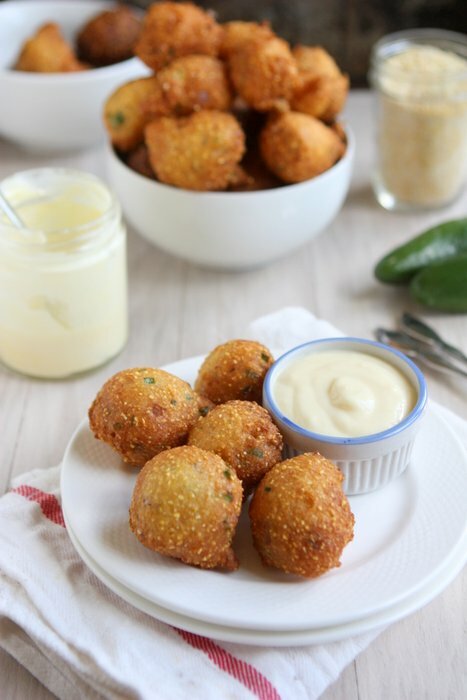 Anyways, I was perusing my cookbooks looking for inspirations when I saw “Heavenly Hush Puppies” in P. Allen Smith’s “Seasonal Recipes from the Garden.” Perfect! 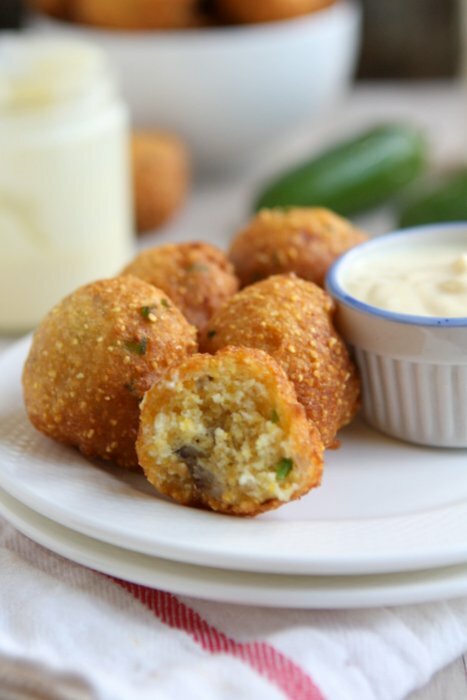 I’ve only really had hush puppies a few times, mostly at a pub in Portland with my dad and brother. I remember O’Connors, the pub, serving semi-Irish semi-creole food, but perhaps I’m way off base there. I did just learn, through a quick google, that O’Connors has serious Montana ties! Their tagline is “Where Montana people meet the rest of the world.” Ha! I had no idea. But back to the hush puppies: O’Connors serves hush puppies with a mango jalapeño chutney: awesome. 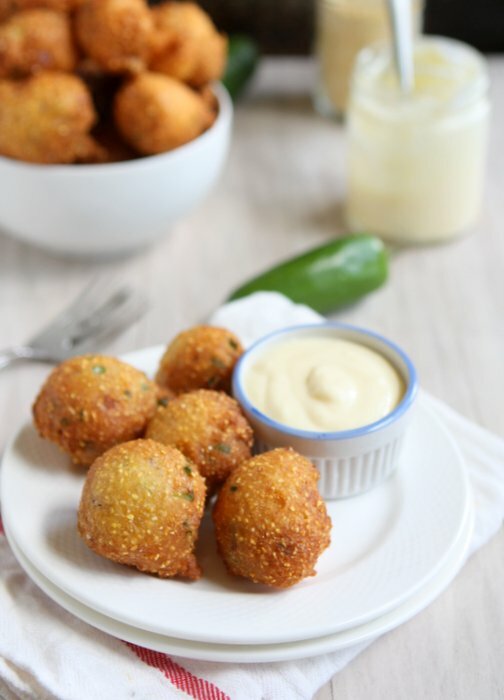 I put a bunch of jalapeños in the hush puppies themselves, so really just wanted a cooling (yet sweet!) sauce for dipping. Mix some plain Chobani with a little bit of orange juice concentrate and honey, and you’ve got the perfect sauce! I’ll admit to have eaten many spoonfuls by itself. These were a hit with the crowd (err, of the two of us?) around here! Best fresh off the press, but we kept eating them long after they’d cooled. Having never made hush puppies before, I was concerned at the consistency of the batter: I was anticipating something much thicker. Don’t worry if it’s runny, just drop the spoonful into the oil all at once and let them cook! These are a seriously delicious snack, or side! Heat the oil in a heavy pot to 350F. Combine the cornmeal, flour, baking soda, baking powder, and salt. Mix to combine, then add the onion and jalapeño. In a small bowl, stir the egg and buttermilk together before adding to the dry mixture. Mix until blended. When the oil is hot, drop the batter 1 Tbsp at a time into the hot oil. Cook for 2-3 minutes total, turning as needed to evenly brown the hush puppies. Drain on paper towels. Combine the yogurt, orange juice concentrate, and honey until smooth. 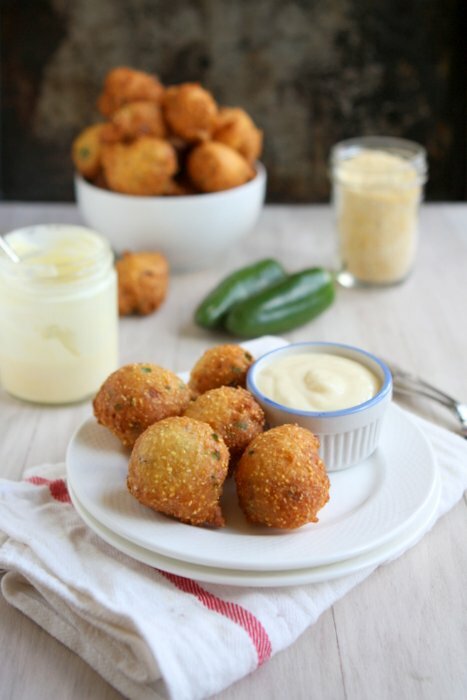 Serve the hush puppies hot with the dipping sauce. 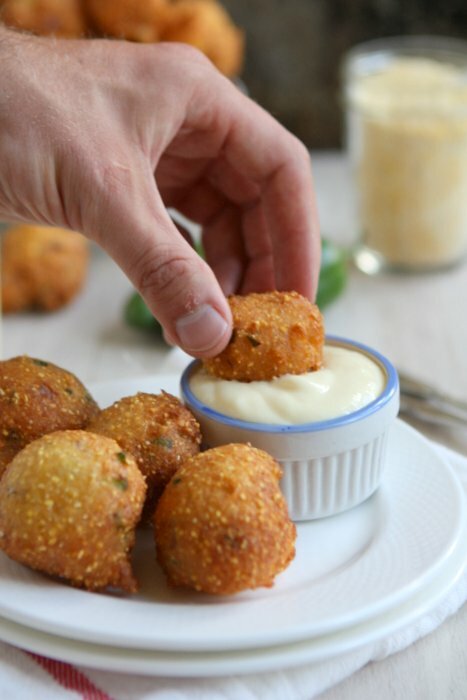 These hush puppies look delicious! My mom is visiting soon and she loves them, it would be perfect to make them for her. broken oven?! that sounds awful!! I love that you used greek yogurt as a dip base instead of sour cream. Can’t wait to try this recipe for my next cocktail party. Ha! Thanks! Broken oven has been awful – two full weeks of it! Supposedly we get a new one tomorrow!